As most of us know by now, Paul Nehlen, the Wisconsin engineer who will be challenging Speaker Paul Ryan for his seat in the House of Representatives this summer, doxxed Alt Right blogger and shitposter Ricky Vaughn. As the writer at Counter-Currents who has written most about Nehlen—four articles, all positive—I feel the need to address this issue. Andrew Anglin provides an excellent summary of the events leading to the doxxing as well as some top-notched analysis . To put it all as briefly as possible, Vaughn had gained enormous influence during the 2016 presidential campaign as one of Donald Trump’s biggest boosters on Twitter. After the election, he was ousted from Twitter and became active on a similar social media platform called Gab where he became a bit of a Dissident Right gadfly, sometimes offering harsh criticism of the movement. This led to a spat with Nehlen who, in retaliation last week, revealed his true identity. The Huffington Post reported on this two days later. Shortly after, Andrew Torba, CEO of Gab, deleted Nehlen’s Gab account. You will note that the details of this little roundup are a bit sketchy. This is because they don’t matter. Nothing could be more irrelevant than whatever Vaughn and Nehlen had argued about or Nehlen’s purported reasons for doxxing Vaughn. Regardless of whether Nehlen was in the right while he was bickering with Vaughn, he quickly slithered into the wrong for what he did. There is no excuse. Ricky Vaughn could have been sleeping with Paul Nehlen’s wife, and Nehlen would still have been in the wrong. Doxxing honest members of the movement—whether they are Alt Right, Dissident Right, Alt Lite, or whatever—should be tantamount to instant expulsion and persona non grata status. This is actually an easy case to adjudicate. Nehlen proved that he couldn’t handle the fame and influence he was having and got a little too big for his britches. He put his ego before the movement and revealed a vindictive streak that, until now, many of us (myself included) thought he had under control. So what’s next for Paul Nehlen? Given how often he shoots from the hip, sometimes without looking first, I really have no idea. That’s what makes him scary. Will he attack someone else in the movement? Will he try to dox me for writing this article? While banishing Nehlen will come easy to the white advocacy, identitarian, and nationalist communities, admitting that we were wrong for supporting him all this time will be much more difficult. I was one of these people, and so I feel I deserve a small amount of the blame for what has happened. It is possible that someone could have been persuaded by one of my Nehlen essays to donate to his campaign or volunteer for him or defend him publicly. A month ago, knowing this would have flattered me. Today, it mortifies. I had been caught up in the excitement of a bona fide political candidate embracing his white identity and pushing for white interests. When he fought hard for us on social media we cheered him on. Even when he was jeopardizing his own campaign with his questionable choice of language or the acidic tenor of his messaging or his constant Jew-baiting, we still rooted for him. He was /ourguy/ after all. It would be easy enough to say that I have been betrayed. But no. 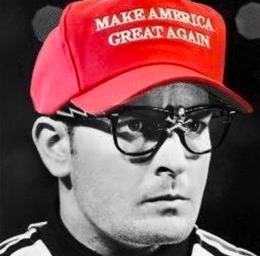 Ricky Vaughn has been betrayed. Regardless of one’s opinion of him, this man’s life will never be the same again. It’s one thing to be outed by the enemy as Millennial Woes was in early 2017. It’s something else to be betrayed by a nominal ally in Nehlen. To a lesser degree, the pro-white movement has also been betrayed. Paul Nehlen had an opportunity to be the ‘first Alt Right congressman’  as Jim Goad put it. Something changed however in late 2017. Nehlen became more interested in leading the Alt Right online community itself rather than taking the Alt Right undercover to Washington. And this was fine too, and likewise a lot of fun, especially if you go on Gab a lot. But by doxxing Vaughn not only did he hurt one of our guys, but he suddenly made the movement a more dangerous place to be if you’re anonymous, like many of us are. And for what? Because some shitposter rubbed his ego in the mud online? Sure, it hurts. I’ve felt a little of that hurt myself. But hurt like that comes with the territory, doesn’t it? Nehlen is a politician. He should know this. I am sure every single Dissident Right leader has felt the pain of character assassination from within the movement. I have seen what goes on. Punches do not get pulled. Things can get quite vicious. But this is still family. We have to remember to always close ranks and keep altercations within the house. That’s how we stay strong. That’s how we eventually win. But by doxxing Vaughn, Nehlen effectively isolated him so our enemies can tear him apart. This is tantamount to working with the enemy, and as we all know, no radical movement can survive long if its leaders work with its enemies. This is why Paul Nehlen harms the movement. This is why Paul Nehlen must no longer be part of the movement. And the thing is, the signs were all there. I’m sure many of us saw them and misinterpreted them as I did. In my review of his 2017 book Wage the Battle , I show how one year ago Nehlen was not much more than a mainstream right winger with pointy elbows, not unlike Ann Coulter. Later, he proved himself highly aggressive with his anti-Ryan memes and wickedly good at trolling. We, of course, didn’t object since Ryan certainly deserved the abuse. Then Nehlen revved up the Jew-baiting and announced that he was reading Kevin MacDonald’s counter-Semitic classic The Culture of Critique. This was also fine. The Jewish Question does need to be pushed back into mainstream discussion, and who better to do it than Paul Nehlen? Furthermore, it’s not like his Jewish targets didn’t deserve a little baiting. But then Steve Bannon distanced himself from him. We chalked that up to Bannon being a civic nationalist, not a real man of the Dissident Right. Mike Cernovich also distanced himself from him. He said Nehlen was not a team player. Well, that makes sense, we thought. Cerno’s a cuck who won’t take on the Jewish Question. So of course he would say that. Then in 2018 (several weeks after my Wage the Battle review), Jared Taylor distanced himself from him. Initially Nehlen had been invited to speak at the 2018 American Renaissance conference. But after taking a close look at Nehlen’s campaign, Taylor disinvited him from speaking (but not from the conference). Nehlen responded by embargoing the conference altogether and making a big stink about it on social media. For me, that’s when the cracks in the dam began to appear. Sure, Nehlen had his supporters, many of whom accused Taylor of cucking to the Jews. But other voices began to pop up. Nehlen’s campaign does lack a certain amount of class. Maybe Taylor was put off by that. Nehlen does kind of beat a dead horse with the Jew thing as well. Maybe that made Taylor uncomfortable. Nehlen also had some nice things to say about Louis Farrakhan, didn’t he? That certainly wouldn’t fly at Amren. So maybe Taylor wasn’t completely out of his mind by disinviting him. Furthermore, Nehlen certainly could have handled it better. He could have realized that the JQ simply isn’t Taylor’s thing and simply acquiesced to a man who has been a leader in this movement for a quarter century. Such unity would have been good for the movement. But no. Instead, Nehlen decided he’d rather hurl barbs at Taylor almost as if Taylor were a real enemy on the fake Right like Ben Shapiro or John Podhoretz. Furthermore, he said nothing when some of his followers posted disgusting comments about Taylor on his Gab posts. This all happened in late March, perhaps three weeks ago as of this writing. This was when I began to suspect that I had made a mistake in praising this man. But the Vaughn doxxing sealed the deal for me. Maybe Bannon and Cernovich had had a point all along? Maybe they knew something we didn’t? Maybe they weren’t cucking? Maybe we were too blinded by enthusiasm to notice? Imagine that. The Alt Lite being right, and the Alt Right being wrong. Admitting such things and contemplating how they came to be is never pleasant. All we can do now is man up and move on and not be fooled again. That, and give a hat tip to perspicacious bastards like the Z-Man, who saw through Paul Nehlen from the very beginning . But you know what hurts the most in all of this? That on paper Paul Nehlen remains excellent. He says the right things on immigration. His #ShallNotCensor legislation is just the thing we need. His economic positions are sound. He understands the pervasive threat of anti-white racism. He hates the Left in all of its manifestations. And, most importantly, he’s woke on the Jewish Question. If such a candidate seems too good be true, well, maybe he is. At least right now. If there is a silver lining in all this, it’s that Paul Nehlen has provided us a blueprint of what a Dissident Right leader can do correctly. And if a leader emerges who can emulate Nehlen in this regard and eschew his now obvious failings, we would have a tremendous leader on our hands. But a question still remains. Despite all that has happened do we still want him to beat Paul Ryan this summer? I really don’t know, because if you can turn on your own, you can turn on anyone.